Make a sweet glow in the dark helmet for night time cycling, costumes, and more that is controlled by the TI LaunchPad. How well will this work on my weed whacker? Does not work well--the grass can see it coming. What could one do with a cross between EL and Fiber Optic wires? Or, have one long wire of EL that goes up the middle of your jacket, with fiber optics drawing some light from the sides, almost like a rib pattern? Or would Light Pipe be better... :/ Meh. If I cut EL wire, will it still work? Make sure the cut is clean so there isn't a short between the inner wire and outer one. And do be aware that you can get a slight shock from the exposed end; if this is a problem you might want to put some tape or heatshrink or dip the end in glue etc. You can also solder a JST pigtail to the leftover piece if you want to light it up. As stated above, here's a good instructable on the procedure. Does it work with square wave or rectangle wave signals? Is there any way to control the wire with any sort of microprocessor? Can a single strand of EL be driven from a RedBoard? here is the theory. Motion PIR attached to a red board with a red EL strand as a baseboard motion activated nightlight to guid my 3yr/old to the bahtroom. I want to keep this as minimal as possable to limit the amount of stuff attached to power and the wall. Not really since the Redboard doesn't have the ability to drive EL wire. You can use a single EL Sequencer which has the ATMega328 built in and the 12V inverter. You do need the inverter to get power the EL Wire can use and you need the sequencer if you want to control that power (if you just want it to stay on you can plug the EL wire directly into the inverter). ok good to know, how flexible is the el wire? could you simulate cursive handwriting? I ordered 10 of them and they are a bit dim in the day light, but as soon as the lights go dim in any area they come to life. Can't wait to get them mounted to our project. We are using them to illuminate they helmet and jersey to our FRC mascot. Will pass along pictures when complete. I know there are different intensity EL Wires out there. (and somewhat subjective as well.) Is this 'regular' EL Wire, or more in the range of 'Super Bright', etc. 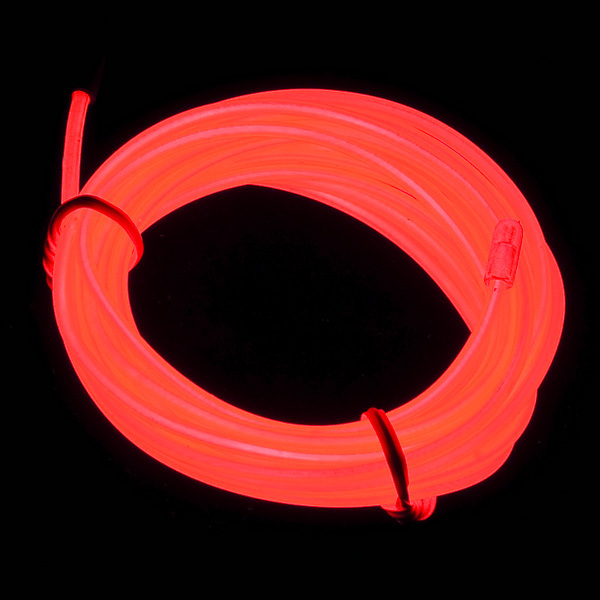 I know the high brightness EL Wire may use twice as much current vs regular EL Wire, but wondering where this EL Wire falls in on the scale of brightness. Hmm, I haven't really seen a wide variety of brightnesses as far as red EL wire goes, so I'd say this probably falls somewhere along the 'average' brightness. The datasheet has the brightness ratings and current ratings in it, so use that as a comparison against other brands if possible if you are very concerned about it. In a purely hypothetical question, how would one go about fixing this wire if the power wires were to separate from the luminescent section? how 'solid' is EL-wire? is it able to support a certain physical tension? It's pretty stable wire, but I wouldn't use it for any kind of weight bearing application. You would likely rip out the power connections before you'd break the wire itself. Do these come with the connecter already attached? 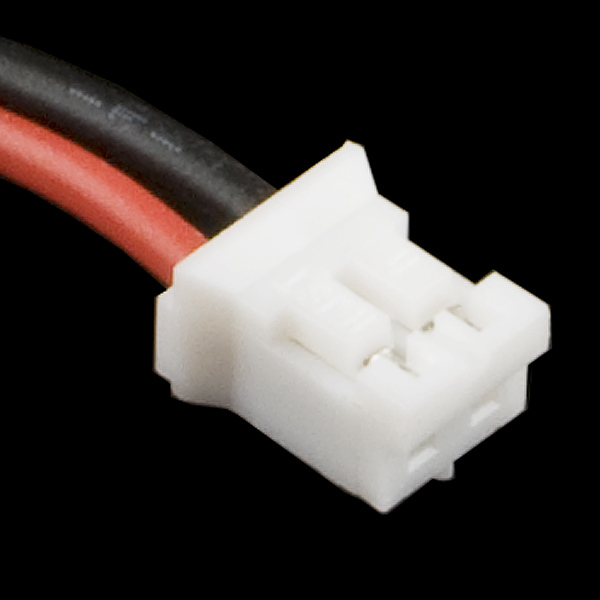 Yes, all of our EL products come with 2-pin 2mm JST connectors pre-attached. The inverter makes a few mA of 100V AC at about 1000Hz; if you have another source of that, you can drive EL wire with it. 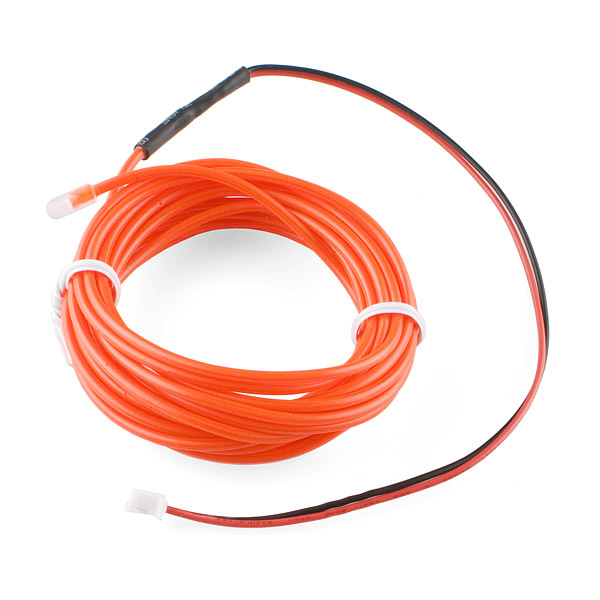 whats the diameter of the EL wire? any chances of shorter lengths? maybe foot long? Is is possible to get longer quantities or does it arrive at SparkFun preterminated? Could EL wire be braided or wrapped somehow, perhaps a red, green, and blue wire and some PWM to create other colors? It's possible, but remember that EL wire works by applying alternating current at around 1kHz, and a PWM applied to that may not yield the color resolution you need, or be too flickery. I'll be getting some 'lit up' pictures of all of our wires soon. I can say that it's somewhat orange though. It's not bright red. I think you have your metric to imperial conversion wrong. I recently bought several of these wires in different colors for my marching band for a night time parade in Denver. Upon returning to the school, the staff started taking the light packs off of the students uniforms and several of the them had the red wires break. This was happening right in our hands, no matter how gentle we were being with them. I have bought hundreds of these over the years but these past 2 years just seems like the craftsmanship has been cheap and fragile. If you have switched to a thinner gauge of wire, please don't!